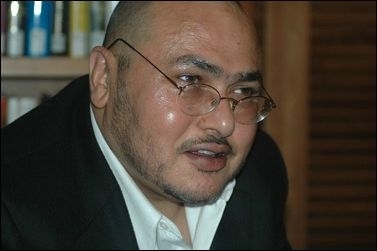 Khaled Abou El Fadl is a distinguished professor of law at UCLA. The once-promising career of UCLA law professor Khaled Medhat Abou El Fadl has faded over the past decade. Gone are the pleasures of glowing attention of the media, the invitations to join important government bodies and to offer expert testimony at high-profile trials. wants Muslims to live by Islamic law (the Shari'a), the law that among other things endorses slavery, execution for apostasy, and the repression of women, and which treats non-Muslims as second-class citizens. "Shariah and Islam are inseparable," he has written, "and one cannot be without the other." In a revealing passage, he confesses that his "primary loyalty, after God, is to the Shariah." This public airing of his true ambitions undercut his pretense of moderation. Thus discredited, Abou El Fadl has, unsurprisingly, been itching to get back at me. He launched a trial balloon in 2010 but displayed his venom more fully in a recent book, Reasoning with God, in which he retaliates by attempting to portray me as "an anti-Muslim propagandist" who "will proudly post on his website narratives or people who allegedly discovered that Islam is a false religion or any piece of writing that questions the authenticity of the Qur'an or anything Islamic, like the very existence of Muhammad, the Prophet of Islam." Trouble is, UCLA's Omar and Azmeralda Alfi Distinguished Professor of Law and chair of its Islamic Studies Program, whose name I shall abbreviate as KAEF, has wandered from fact into fiction. In the spirit of amicable academic hygiene, I offer some corrections. The above passage contains two problems. First, my website contains an archive only of my own writings, so I do not "proudly post" anyone else's. Yes, DanielPipes.org does host 140,000 comments from readers, but these run the gamut from praising ISIS to despising Islam. For KAEF to hone in on a sliver of this spectrum only serves to undermine his credibility. Second, I wrote an article in 2000, "Who Was the Prophet Muhammad?" in which I surveyed revisionist works that raised questions about the historical accuracy of events of the usual chronology of early Islam. KAEF responded savagely then, and shows that 15 years later, he still remains outraged by that little article. He implies that I should follow Islamist pieties and not show interest – much less approval – of scholarship that might shed doubt on sacred myths. What kind of "professor" is this? While propagandists such as this pretend to encourage Muslims to reform and progress, in practice they impugn the motives of any Muslim reformer who sees any merit in the Islamic tradition whatsoever. … the only Muslims these Islamophobes seem to like are self-hating Muslims who are ashamed of everything related to their religion. Hardly: what KAEF calls "self-hating Muslims" are anti-Islamists battling to bring their faith back from the hell holes of extremism, whether the barbarism of Boko Haram or the subtler villainy of a KAEF. I admire and support the work of pious Muslims, such as Zuhdi Jasser and Raquel Saraswati, who devote much of their lives to fighting Islamism. What Abou El Fadl calls "self-hating Muslims" are anti-Islamists battling to bring their faith back from the hell holes of extremism. Next: when others and I call someone like KAEF an Islamist, he charges we use it as "a cover for expressing an anti-Muslim prejudice." But Muslims also use the term Islamist or one of its synonyms to characterize the likes of the Taliban, Al-Shabaab, Khamene'i, and Erdoğan. Would KAEF maintain that the tens of millions of Muslims demonstrating on the streets of Egypt against the Morsi government were "expressing an anti-Muslim prejudice"? KAEF then gets personal, accusing me of labeling "as Islamist any Muslim who threatens Pipes's own sense of superiority toward Muslims or who threatens his sense of political and social priorities." This business of my "sense of superiority toward Muslims" is a calumny fabricated to insult me. I challenge KAEF to produce evidence for this scurrilous claim. As for Islamists, I do not feel superior to them; I respect them as a worthy enemy and am at war with them. KAEF closes with a final attack: "although perhaps not as extreme as Pipes, there are substantial numbers of writers who attempt to understand the world of Islam through a binary vision that ascribes to Islam everything that is inferior." No, dear KAEF: I am not "extreme," or even anti-Islam, but solely anti-a-certain-kind-of-Islam - the kind I call Islamism - the kind to which you subscribe. You epitomize the first clause of my refrain that "radical Islam is the problem, moderate Islam is the solution." Abou El Fadl and I disagree on one of the great issues of our time; what a pity that his scholarly deficiency and intellectual dishonesty preclude a constructive debate. Mr. Pipes (DanielPipes.org, @DanielPipes) is president of the Middle East Forum.